Shortly after the theatrical release of True Grit, the Coen Brothers were approached by Entertainment Weekly and asked to name their favorite Westerns. Disregarding whether some of the titles were mentioned jokingly as favorites, I decided to seek out the two I had never seen before: Greaser’s Palace (1972) and ‘Doc’ (1971). I sometimes like to browse through both the positive and negative customer reviews on Amazon.com, mostly to look for differences, as well as similarities, in tastes. And occasionally the reviewer will recommend other interesting items or titles. This was the case when browsing through what Dr. James Gardner (of California) had to say about the DVD of Doc. 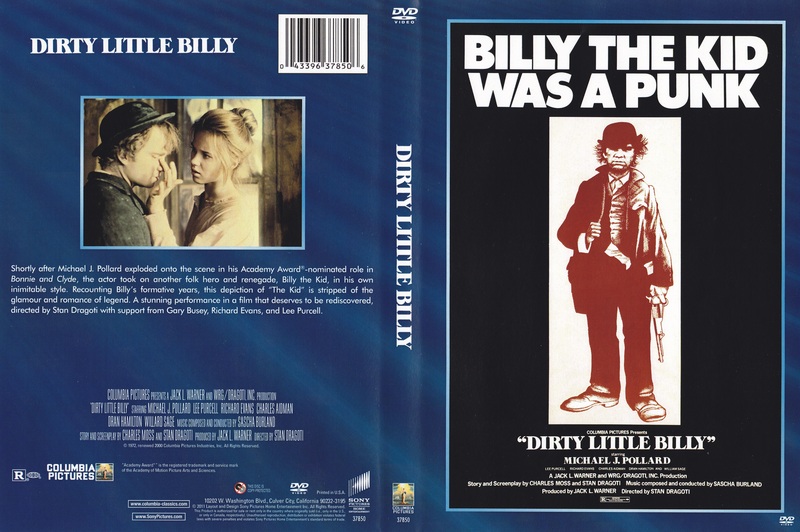 His referral of Dirty Little Billy (1972) as “the ultimate revisionist Western” intrigued me, as did the film poster. And so, a few days after I watched Stacy Keach, Faye Dunaway, and Harris Yulin in Doc—which wasn’t bad at all—I had my first viewing of studio magnate Jack Warner’s last independent production; having obtained a poor, but watchable, TV-recorded copy. Now, thanks to Sony Pictures’ Screen Classics by Request, it’s officially available on DVD. And it’s very unlikely that the film has ever looked or sounded better. Dirty Little Billy is a tale of how an inept New York teen brought out west transforms into a menacing outlaw. The chemistry between the characters, the balance of humor and drama, and how the story is told, causes my “little grey cells” to dance with ideas. It doesn’t matter that this is fiction inspired by Billy the Kid’s life, or that there aren’t any admirable figures. This is finely crafted entertainment with a scenario that could be set nearly anywhere in the proceeding centuries, presenting the banding of society’s misfits and how each one is molded. This film will be of interest not only to American and Spaghetti Western fans, but to both cinephiles and movie watchers in general. The first image is of the fresh mud that welcomes the McCarty family to the fourth-rate town of Coffyville, Kansas. The soft wet earth feels as if it’s always been there, though the family has just arrived a day after one of Coffyville’s “famous sun showers.” Young Billy, his mother Catherine, and his stepfather Henry are quickly sold a dusty, run-down farmhouse harboring a goat and two chickens. Their sales agent is Ben Antrim (an amusing performance by Charles Aidman). 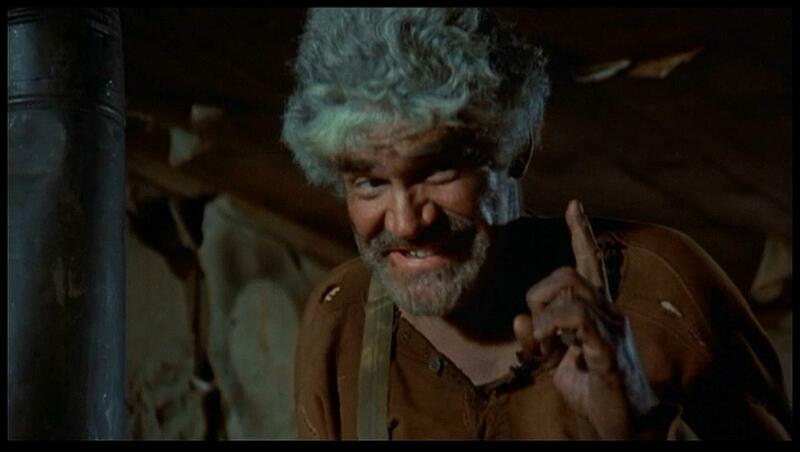 Supposedly, he has people coming here from all parts of the country to “work themselves to the bone, so that he can get rich.” During a town meeting (featuring Gary Busey), Antrim passes along a rumor regarding an epidemic in a nearby town, which will “hopefully” force out its inhabitants and have them move into theirs. The rise in size of Coffyville’s population would thereby qualify them as a “third class city,” which would allow them to elect a mayor, a council, and a professional peace officer. The McCartys. 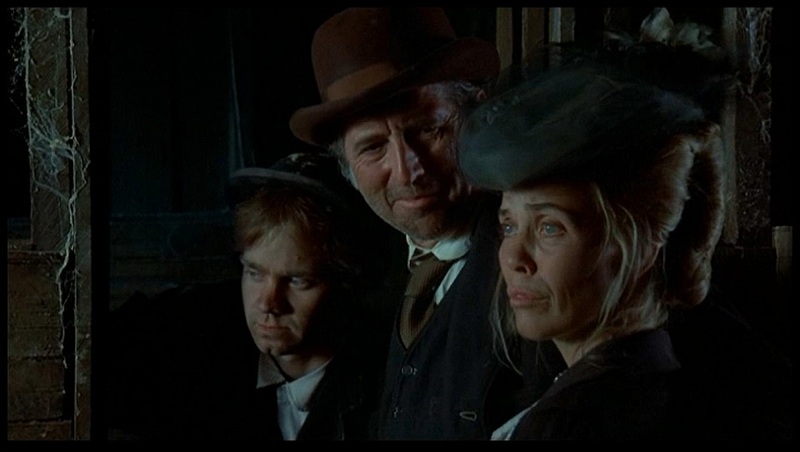 Billy (Michael J. Pollard), Henry (William Sage), and Catherine (Dran Hamilton). Henry McCarty (William Sage) is a hard-working Irish immigrant wanting to cultivate his own land, while Catherine (Dran Hamilton) wants her son to follow his lead and adapt to a new routine. Billy’s mother seems to have always been too soft on him, while his stepfather is too hard. Having “bellyached on the train, all the way out here,” Billy just wants to be back in New York. The little “bum” hates farming. Henry’s growing intolerance for Billy’s uselessness to him boils over one night, and he threatens him into running away. Billy doesn’t need much persuasion to leave, as he really just wants to get back east. But having no money, he can’t go very far. “Just walking” through town, Billy gets caught in a cross-fire between Antrim’s inexperienced lawmen (Ed and Len) and the town’s residing menace. Goldie (Richard Evans) is a saloon dwelling, card gambling degenerate who sometimes violently demands for the prostitution of his girlfriend (Berle) to help financially support them. Both his nonconformist stance against Antrim and the fear he generates around town appeals to Billy, who does what he can to gain his respect and mentorship. “Double or nothing.” Stormy (Scott Walker) and his girl Lou (Rosary Nix). Michael J. Pollard’s eccentric performance is as fascinating as you’re likely to read about elsewhere. But upon repeated viewings, which I have found rewarding and worthy of study, the supporting cast becomes more and more noticeable for their fine contributions; even when just relying on body language. Keep an eye on the silent exchanges between Billy and Lee Purcell’s Berle—they’re beautifully directed, and quietly contribute to his character’s development and aforementioned transformation. Richard Evans deserves special mention. 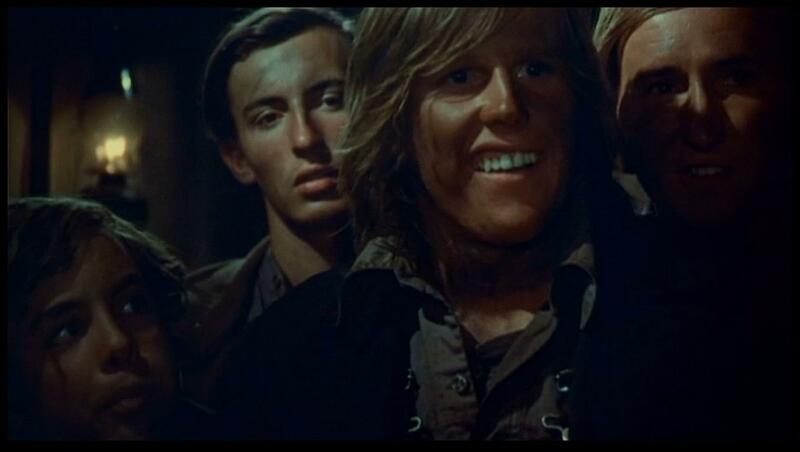 Goldie is such a brilliantly written component to the detrimental education of Billy the Kid—at least, in this story’s universe—and Evans acts within the confines of that character’s restricted psychology so well that he’s easily one of the most important ingredients to the film’s potency. Besides all around great acting—including the extras, which is a rare thing—and editor David Wages’ crackerjack timing, the cinematography by Ralph Woolsey (of 1970’s Little Fauss and Big Halsy, and 1972’s The Culpepper Cattle Co.) compliments both the richly detailed sets and the performers perfectly. His use of sunlight is also impossible to miss. It’s really a treat for a movie lover to find something as well-crafted as co-author/director Stan Dragoti’s feature film debut. 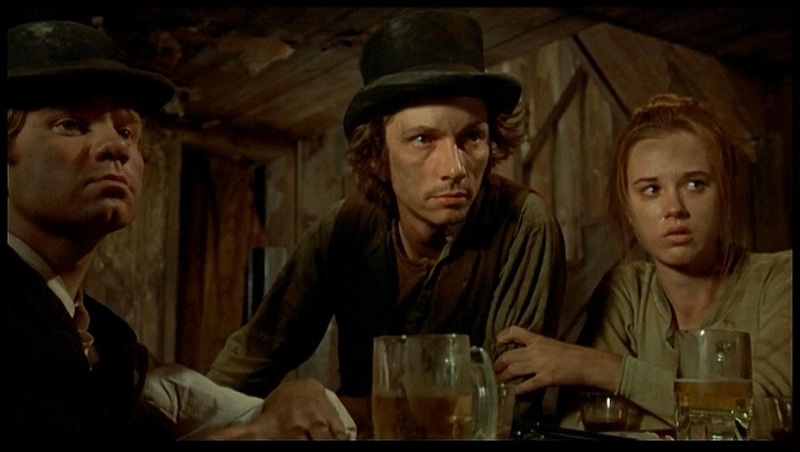 And it’s due to a recent viewing of The Hired Hand (1971)—an extraordinarily gorgeous film—and Dirty Little Billy which has inspired me to write my second Western. One dedicated to the genre’s future. I don’t buy too many movies, but this one’s a keeper. My compliments to the entire cast and crew. Billy, Goldie (Richard Evans), and Berle (Lee Purcell). “What the hell more do you want?” Ben Antrim (Charles Aidman) asks Billy. A great movie, David! I was very impressed as well. I just watched an oater from ’71 I had never heard of called Wild Rovers with Ryan O’Neal and William Holden that was quite good as well. You might give it a look. Thanks, brother. It caught my eye while browsing through Warner Bros. Archive last week. I’ll be sure to check it out. Congrats on the site David. Hey David, you may like Skin Game with James Garner and Louis Gossett Jr. It’s definetly a departure from the kind’ve westerns we’ve been talking about. It’s a pretty lighthearted comedy given the subject matter, and I think it was made for TV, but I just watched it on Netflix Instant and enjoyed it. Two conmen, one white and one black in 1850’s Kansas/Missouri pull a scheme where the white man sells the black man on the auction block then breaks him out and splits the take (sort of like the Blondie and Tuco scheme in Good The Bad And The Ugly) later. It’s very fluffy, but I found it charming. Thank you so much for keeping me in mind. I bumped it up to the top of my Instant Queue. It sounds like fun. I saw that it was released thru Warner Brothers’ Archive Collection, too—you’ve gotta love their catalogue. The film’s DVD webpage (see below) does show a theatrical release date, and they are offering it in widescreen. I’ll try streaming it first, though. Thanks again! I just sent you an email letter. This is a great movie. I saw it years ago on a grainy VHS and I really need to see it again on DVD. Very unusual to say the least and Lee Purcell is really good as is Richard Evans, who apparently emailed you. WOW! Congratulations! Evans is a real nice guy, and was very appreciative of my review. I should have asked to interview him about the film, but I was too shy about it. Maybe I’ll work up the nerve when I’m done writing my new story. I still got his email address. By the way, I was able to get your new review on “Oklahoma Crude” spread around on Twitter today, with the help of some friends (@TheDenzMan and @Michael_Flores). Looking forward to checking that film out. I look forward to hearing what you think of it. ‘The Hired Hand’ is another good one and I’ve been meaning to see ‘Pat Garret and Billy the Kid’ for a while now. I’ll make that a new year’s resolution. 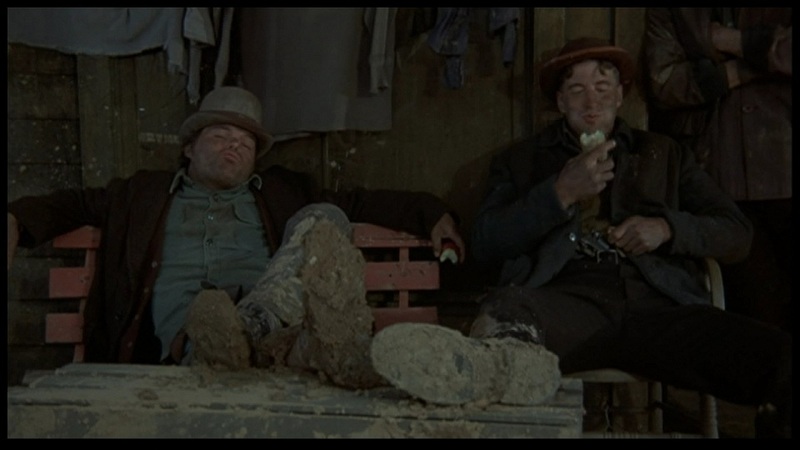 A couple of other good revisionist westerns that have just come to mind that you may like is Robert Altman’s ‘McCabe and Mrs. Miller’ and also ‘The Great Northfield Minnesota Raid’ with Robert Duvall and Cliff Robertson. 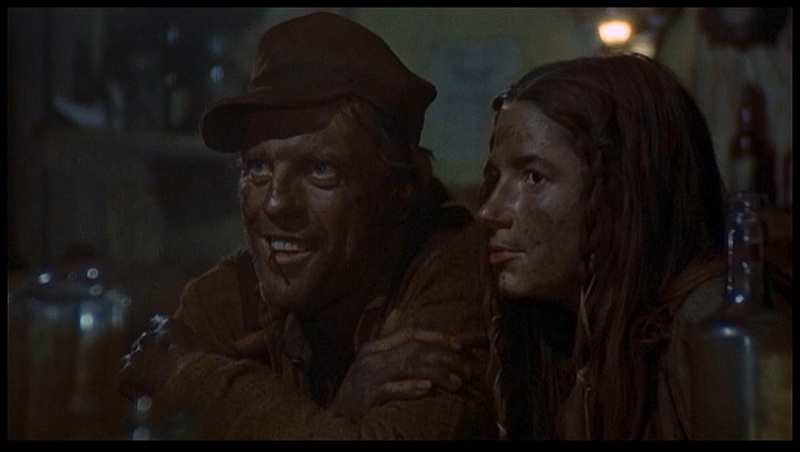 I love ‘McCabe and Mrs. Miller’, and I remember enjoying parts of ‘The Great Northfield Minnesota Raid’. I might need to revisit that latter title, as it’s been a few years since I last saw it. Maybe I wasn’t in the mood. 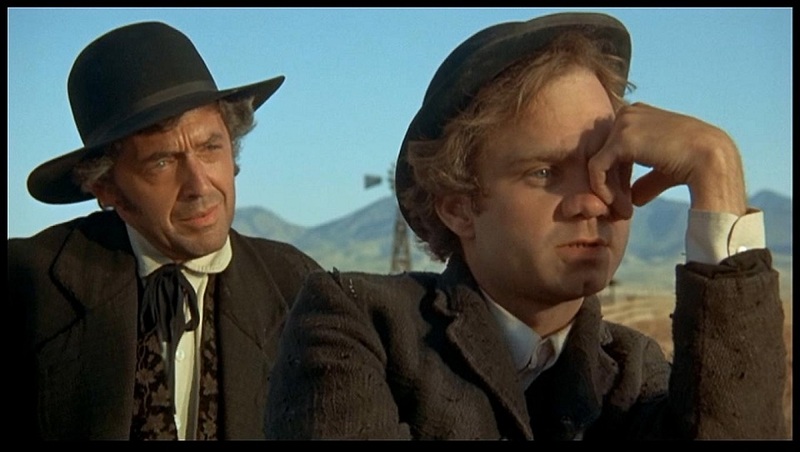 Speaking of revisionist westerns, have you seen either ‘Doc’ (1971) or ‘Heaven’s Gate’? I’m madly in love with the Criterion Blu-ray, with Cimino’s cut! I watched it twice last week! I remember back in 1980 when ‘Heaven’s Gate’ came out it was a bomb at the box office and almost universally considered a bad movie by the critics at the time, so it scared me away from watching it. However, I know as the years have passed people are viewing it with a kinder opinion, so I will resolve to put that one on my to-watch list as well. 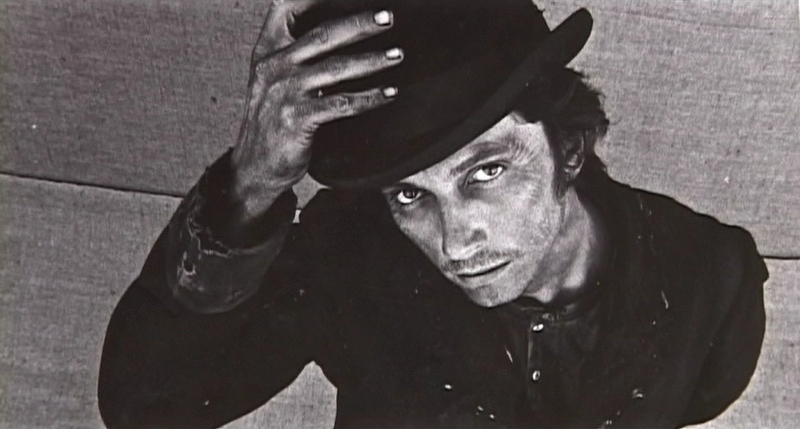 Recommending which of the two versions of ‘Pat Garrett and Billy the Kid’ to see is tricky. While I prefer the 1988 Turner Preview Version, the 2005 Special Edition is a tighter film; their removal of one of my favorite shots in the newer cut is unpardonable. The Turner Preview Version makes me feel like I’m drunk (in a good way), and I enjoy it more with the story’s mood. Just talking about it makes me want to see it. Nice to see so many good Westerns get a mention, especially YELLOW SKY! There are actually three versions of PAT GARRETT & BILLY THE KID. The first was the release version made by the studio after Peckinpah was fired (the studio likes to pretend this didn’t happen and that this version never existed — but in fact the film was only saved by Roger Spottiswoode sneaking the rough cut off the lot in Dennis Dolan’s car). The second version – a very long cut in which all the scenes run to at least five minutes – was screened at the DGA in the 1980s and released on DVD. A third cut (which combines the shorter scenes of the studio version with the missing scenes such as the opening and closing and the visit to Chisum’s ranch) was created later, and this seems to be the version under discussion now. The longest cut of a film isn’t necessarily the best and the third cut seems to me a nice compromise, given that Peckinpah was never able to finish editing the picture. Looking forward to seeing your Kickstarter video up and running. Know that I will financially and socially (Twitter, Facebook, etc.) support the making of BILL, THE GALACTIC HERO, as I would any future project directed by Alex Cox. If you’re not Alex, but can relay a message to him, please tell him that the author of this blog greatly admires his film work, and that they inspire me to tell stories.